Yes, it’s that time of year again, the days are shorter and that north wind blows cold! If the weather in the UK is cold, you can bet that it’s really really cold in northern Scandinavia and Russia. 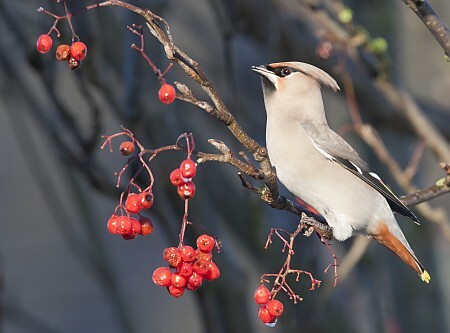 The winter favourite for most birdwatchers and photographers alike is here again – Bombycilla garrulus, the Bohemian Waxwing. 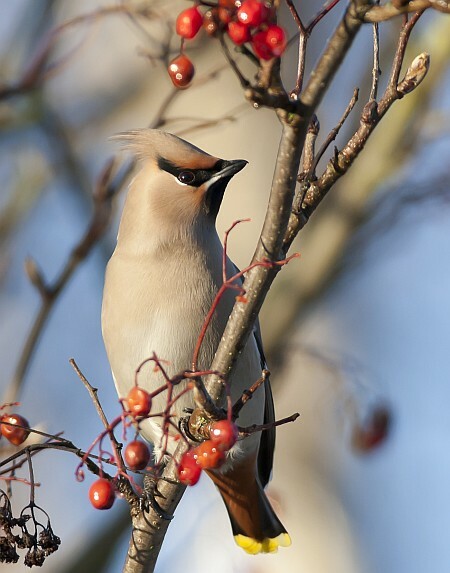 Not to be confused with its North American relative, the Cedar Waxwing (Bombycilla cedrorum), the Bohemian Waxwing lives and breeds in the very north of Europe. 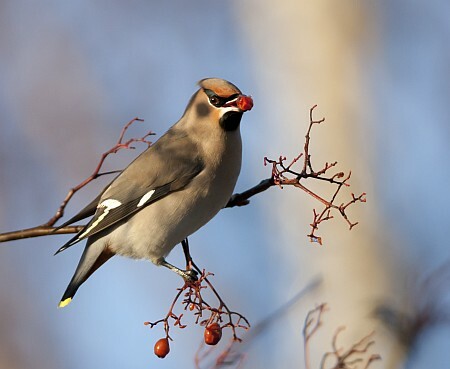 Cold winters drive them south, in fact many of them die trying to reach southern “warmer” climates, where they travel in search of food. As they cross the English Channel, many arrive hungry and weary from their journey. 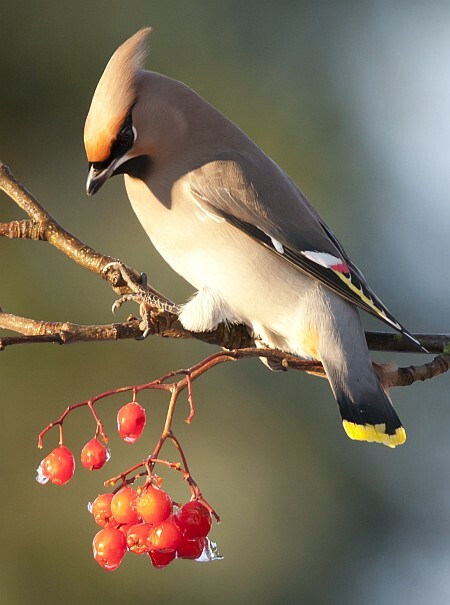 Unused to humans, many Waxwings are tame and will on occasion allow feeding from your hand. When thousands arrive into Britain, it is known as an invasion or an irruption. 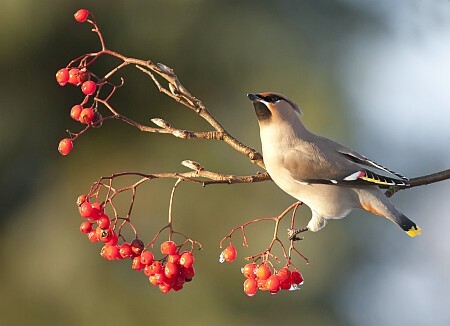 They are called Waxwings because of the “waxy” like tips on their feathers, of bright yellow, especially the bright males. 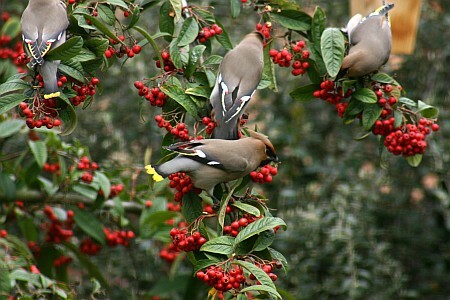 They love berries, especially Cotoneaster and Rowan, Hawthorn and Rose. 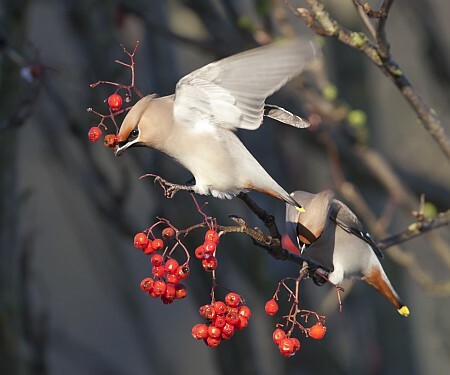 They gather high in the treetops, their call a beautiful trilling or ringing, then suddenly one or two will swoop down to the berry-laden tree, followed immediately by all the other, where a feeding frenzy begins. 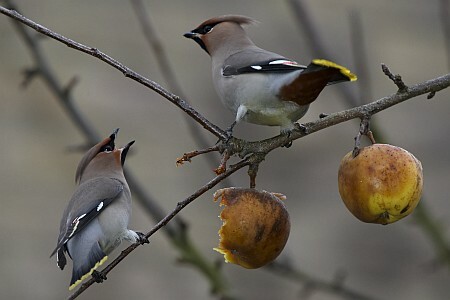 Occasionally squabbles ensue and rival birds can fight each other quite fiercely – they also love apples! since they visit in winter, the light is not always kind, so sometimes you have to make do with the dull conditions. However on a bright winter’s day, with a blue sky, they cannot be topped for sheer style. Getting a close-up of the male with his fiery red, yellow and white plumage and his silky-smooth feathers, is the challenge of all bird photographers. 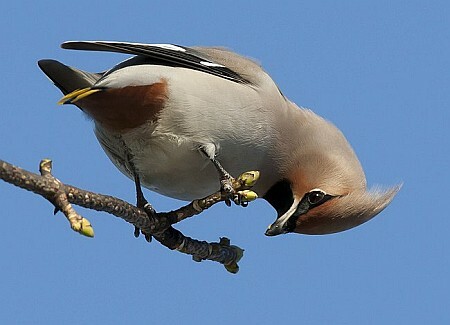 This bird was so interested in the “growths” on the ash tree – as were all the others. They picked the growths off the bark with precision. 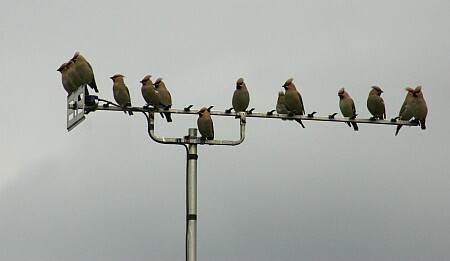 They hang around in the most peculiar of places. 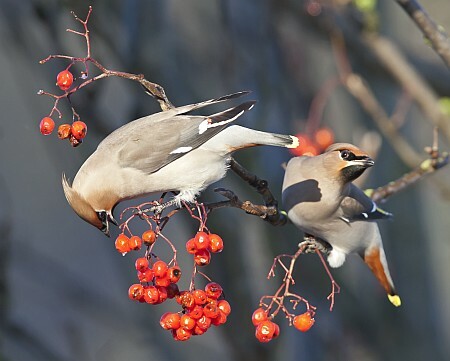 Wherever you see Waxwings, enjoy them for what they are, a beautiful, unusual, comical and spectacular visitor from the cold north – enough to warm any-one’s heart on a cold winter’s day.